Fresh water sources are becoming increasingly depleted as the demand for residential, agricultural and industrial use continues to rise. Learning to harvest, store and manage water supplies is becoming an ever more important survival skill and will continue to do so. One of the purest types of water is rainwater when it falls through the unpolluted air directly into a clean container. However, the rain that falls in cities or flows across open air surfaces such as outdoor basins or roofs is another story. Run-off rainwater can be a health hazard due to contamination from air pollution, pesticides, animal feces, dead insects, car exhaust and fuel spillage, and even lead paint. If you are using the rainwater for toilet flushing or lawn watering (two of the major uses of residential water supply) then the purity required is not quite as high. But you will need to minimize or eliminate contamination if you intend to use rainwater for drinking, by using good filtration. If you live in the U.S., collection of rainwater – shockingly – is not actually legal in some states. It’s fairly absurd that what falls from the sky can be owned by someone. 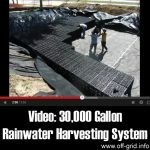 But there are municipalities, counties, and cities that prohibit rainwater harvesting. In areas that do allow it, you have to be aware of local or state regulations for rainwater collection systems and storage, equipment, and methods. Please research and seek the appropriate advice from your local government’s environmental, zoning, building and health departments before you install a rainwater storage system. 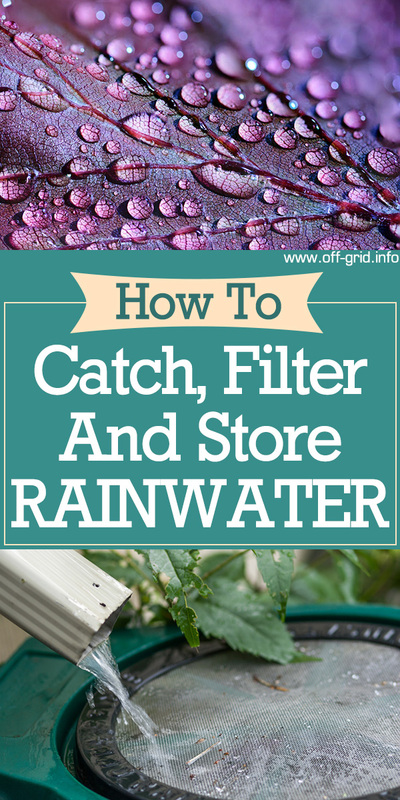 There are several ways to assure the rainwater you harvest is clean. Your roofs and eaves trough must be clear as possible. You can use a mesh strainer to remove leaves and large debris. The rainwater must be harvested in a tank that is channeled to a biosand filter. You can also use a small air bubbler to keep the water aerobic in the storage tanks. Adding bleach in the correct quantities to the storage tanks can also help prevent the growth of algae and this is the method utilized by municipal water supplies. The rainwater should be stored in a clean holding tank or other nontoxic containers such as food-grade plastic barrels. Add a first-flush diverter to improve rainwater quality. This first-flush device keeps the impurities and debris from entering your holding tank. Commercial water filters are effective against different types of contamination. Common filter types used for rainwater collection systems include activated carbon, ceramic, and membrane. Filters are tasked to remove parasites and bacteria, but they are not typically relied upon to remove viruses. 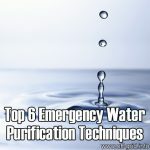 You can add iodine to the water or use UV sterilization to kill viruses. Further carbon filtering is a must after iodine treatment to remove excess iodine. The U.S. Centers for Disease Control and Prevention does not recommend using rainwater as a drinking water resource without disinfection, filtration, and regular maintenance. The CDC is in fact strongly against allowing rainwater into a household drinking water system. So as a homeowner, you must take responsibility for the safety of your own rainwater collection system. 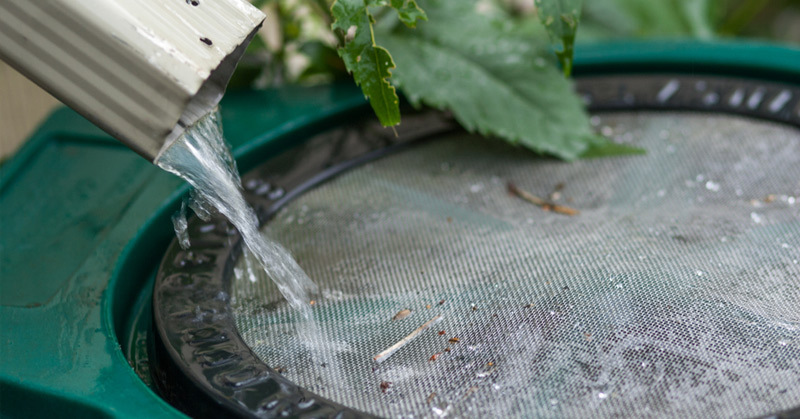 If water supply is limited but not non-existent, consider using your rainwater for non-potable purposes first: Garden watering, cleaning and other outdoor uses are ideally suited. 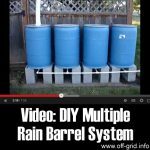 • Place the storage tanks or barrels under a downspout. Do not put them near utility services or septic tanks. • Never leave any openings to the barrel uncovered. • Do not drink unfiltered and untested water. • Overflow ports / additional tanks are vital when the barrels receive much water. 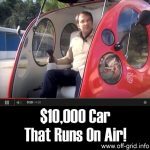 • The tank needs to be drained every three to five years. • Seasonal maintenance schedule and regular cleaning of the tanks is also important. 50+ Top Wilderness Survival Tips!